Weighing in at less than 3.5 ounces (about half the weight of standard tubing), this innovative tubing system offers a lighter and more flexible alternative to standard gray tubing. This greatly improves system performance by reducing pull or torque on the interface that can disrupt seal. The Hoses Purchased are the lightweight ones that I've been looking for. no tugging on the mask during sleep. These are the original OEM product so am very happy with the purchase and will be back for more in the future. Great product, comfortable to use, very flexible. Service was very good. I will use you again when needed. I purchased a 6' replacement hose from you and I am very happy with it. It is very light and flexible. I barely can tell it is connected due to its light weight. Very nice. This hose is an exact replacement for the original. The price is great also. The only thing that would be better is if the hose was a little more flexible. Other than that , I have no complaints. The tubing was exactly as described. It perfectly matched the one I needed to replace, (minus the air-leak). Shipping was very fast. Actually, the tubing arrived before the projected ship day. I am very pleased and will look to fill my CPAP needs through this site in the future. Thank you! The tubing is just what I expected. Thanks for the price. I saw it on another website and it was three times the price. I also saved $2 on the tubing with a code I found on another website. Thanks for everything! Your company's awesome! If you can, please keep the prices low and offering discounts! Thank you, again! Keep up the great work! Excellent. Extremely satisfied. Very flexible and just as good as the original. Great bargain. Will definitely purchase again. The process was easy and went as it should have, no problem with the ordering, receiving or the condition of the hose we ordered. All was good. does not drape as easily as I hoped. 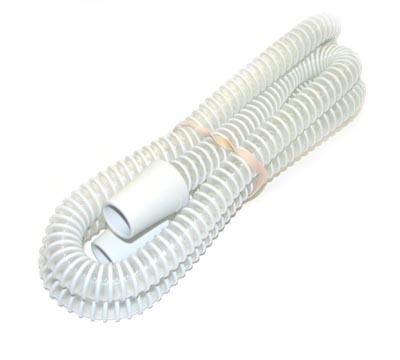 This tubing is not as flexible as I had hoped, not as flexible as the Respironics brand tubing that came with my Respironics CPAP earlier this year. This tubing does not drape easily - after a few weeks of use it retains the kinks that it had in the package. I was hoping the Respironics brand name would be better than the replacement tubing I get from my Medicare supplier, but it is not. It's working fine, though the tubing seems flimsier than my original. I don't think it will last very long. But reasonably priced, so I'm not too upset. As expected. Good price and speedy delivery. This is an inferior product. The tubing keeps splitting. My husband has had three in the last three months. It is lighter in weight, but is not worth trying. Product is eaxacly what I expected and arrived on time. As usual, quality merchandise at a very good price. Super fast, secure packaging and delivery. Thank you! The tubing is working great. Delivery is very fast. This company is the greatest in customer service.